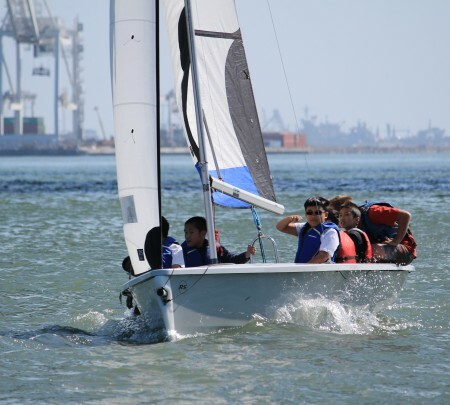 The Portsmouth Sailing Project is funded by Travis Perkins plc and will be hosted by Portsmouth Sailing Club from Monday 27 July until Sunday 30 August 2015. The project has a target of providing sailing taster sessions for up to 1000 young people aged 9-14 years during the 5 weeks of operation. Through using specially adapted boats this project will also allow both disabled and able bodied young people to sail together during the 3 hour sailing session. This unique and exciting project aims to inspire a new generation into sailing, breaking down barriers to participation and create an opportunity for young people of diverse backgrounds to take up the sport in the local community. This will be achieved by providing the initial taster session for free and then signposting the opportunities to attend affordable sailing sessions with local providers, giving them the chance to attend regular sessions and progress in the sport. Speaking on behalf of the 1851 Trust, CEO Alasdair Akass said “The 1851 Trust is a charity of huge ambition and one of our core objectives is to open up sailing to the widest possible audience of young people. It’s great to be partnering with the Andrew Simpson Sailing Foundation on the Portsmouth Sailing Project, who have such an impressive record of delivering transformational sailing experiences to young people nationally and internationally, to give youngsters from the Portsmouth and the surrounding area the chance to set sail on one of the most iconic stretches of water in the world. We are so grateful to Travis Perkins for making this project possible”. Andrew Simpson Sailing Foundation Trustee and Patron of the 1851 Trust, Sir Ben Ainslie added “Having two great charities working together to get young people from Portsmouth out on the water and experience sailing is just fantastic. Next week the BAR team will move to our new home on The Camber, and we are very much looking forward to seeing lots of young people out in boats over the summer. It’s great that two charities with similar objectives of helping young people get onto the water, to experience this amazing sport, are able to do so during and after one of the most memorable sailing events Portsmouth has ever seen”.